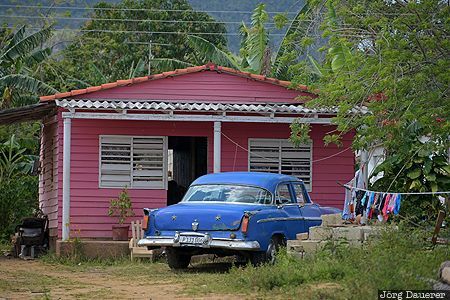 A blue car in front of a pink wooden shack surrounded by the green landscape of Viñales. Viñales is in the province Pinar del Río in the west of Cuba. This photo was taken at around noon on a sunny day in February of 2016. This photo was taken with a digital camera.